I have finished 141〜150 of K1. The story is "Alice's Adventure in Wonderland". I have finished 131〜140 of K1. The story is "Alice's Adventure in Wonderland". The Mouse said, "We're all mad here." This words may suggest that we're all mad in this world. Sometimes, I wonder that I am in Wonderland now. 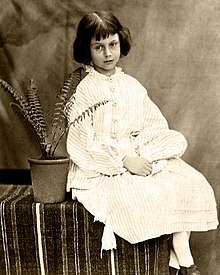 This is a picture of real Alice. She asked Lewis Carroll to write this story down for her. I have finished 121〜130 of K1. The story is "The Greatest Leader of India". I think that Gandhi had perfect thinking, which should be called symmetrical thinking. ”Indians treat the pariars cruelly and loathe them as bad people. But Indians demand equality from British.” This is not symmetrical. "To bring about peace, we get ready for war." This is perfectly wrong thinkings, too.